I just want to make a brief note of a symmetry that recently crossed my desk on the subject of book looting and burning in and after World War II in East Asia. Yes, in this type of scholarship, MacArthur is nothing more than a ne0-Hitler in pursuit of the destruction of Japanese culture, while China’s claims to Japanese cultural artifacts or reparations are simply ignored. Let’s see….MacArthur….Hitler…cultural artifacts….censorship and propaganda…Oh wait a second! 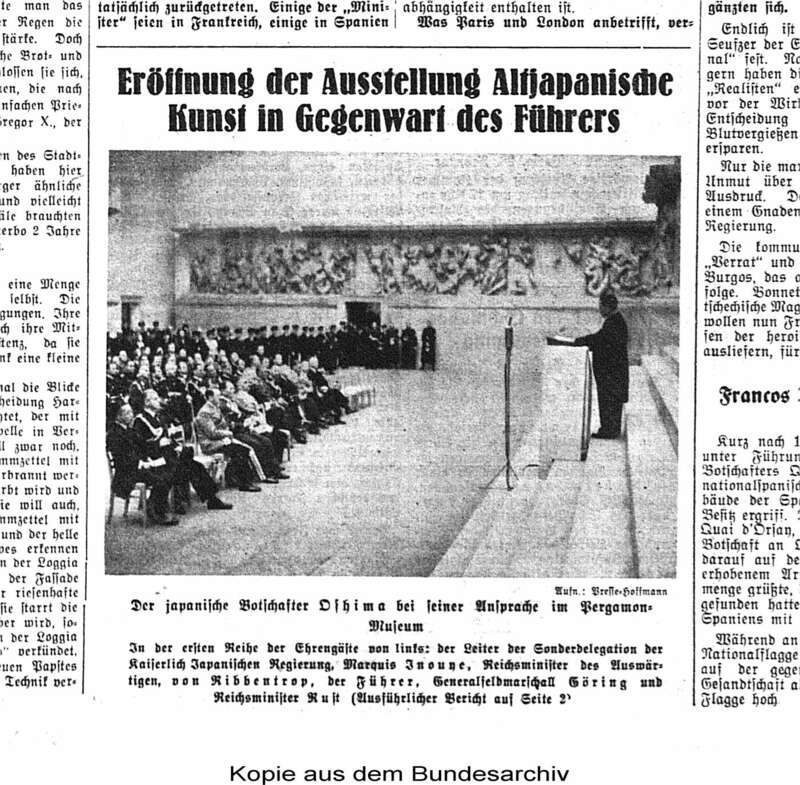 Ambassador Oishima Speaks to Adolf Hitler and Assembled Guests at "Opening of the Fuhrer's Exhibition of Ancient Japanese Art," Berlin, 1939 -- image courtesy Adam Cathcart, who snagged it from the German Bundesarchiv in Berlin, Lichterfelde West. As I argue in this issue of the journal Studies on Asia, China was entitled to and actively seeking to regain its cultural patrimony — including books — from U.S.-occupied Japan in 1946 and 1947. My research indicates that MacArthur was far, far more receptive to Japanese arguments at the time for withholding such items from the Chinese, and rebuffed attempts from outsiders to take away Japanese books. And scholars have lately been rather critical of MacArthur’s unwillingness to go all-in for a kind of full-scale reform of Japanese education and the deep roots of militarism in Japan, making the Article IX (the peace clause) in the Japanese Constitution a kind of quick fix and propaganda ploy so that MacArthur could get home and run for president. For a more objective look at MacArthur’s policies on all fronts, including cultural reforms and censorship (which nobody denies was going on, after all), see Eiji Takamae’s immortal and extensive work GHQ, reviewed here by a talented translator who was in Japan as a 19-year-old in 1946. In short, the paper by the SDHF scholar is worth flipping through to understand what kind of specious arguments are being made by the Japanese right wing, but not as a guide to reality at the time. The stretching metaphors — MacArthur not just as Hitler, but as Qin Shihuangdi — and the first footnote that indicates that “burning” is used more as metaphor than anything else, ought to be sufficient to indicate that. Besides, if the SDHF was serious about taking on the U.S. for scotching East Asian libraries after 1945, they would also rise to the defense of the North Koreans, whose libraries and documents were absorbed wholesale by Douglas MacArthur’s forces in the great northern onrush of the Korean War in fall 1950 and continue to be held in the U.S. National Archives. Finally, it appears to me that Chinese scholars are doing a great deal of research on popular perceptions of the war in both China and Japan. One can only hope that the members of the SDHF are adept enough to realize that their, well, inflammatory work may only serve the function of stirring up more Chinese university students and is unlikely to sway scholars who actually write books about these topics. But perhaps that is the whole point after all. 1)I never even heard of this so-called SDHF before,but checking the name of the people involved,it is a ragtag of right wing authors and many of them are not exactly academics.They have victimized feeling for being marginalized in post-war Japan where they think liberal and left wngs are dominant in media and academic sphere. 2)I think you’re fighting a red herring with another red herring.Basically the argument SDHF guys are making is on “censorship”and more you write on the subject,more you derail from the issue. 4)There are other books written in Japanese on the issue which is much more reliable than SDHF　such as those from late Eto Jun et al. Indeed.But freedom of speech have it’s own flaws such as the allowing vocal minority such as SDHF.Yet I have to wonder why it is always the revisionists who get the spotlight and not the mainstream Japanese academics who actually write on the dark age of their nation. I have to say this is a fearful asymmetry. Aceface, thanks much for this extensive comment, and hope to see you back at this site from time to time, the intelligence is appreciated. I am printing up the post and re-reading it this evening along with your comment so as to get the “red herring” angle figured out, as logic is certainly needed by those who analyze the vocal minority! Well,here’s what I think of “some”of your argument is derailing the topic and confusing. 1)SDHF guys are making argument based on trivial matters from occupation years which happened in the forms of confiscation and incineration of books that does not match the policies of GHQ who promote themselves as the liberator of Japanese and promoter of democracy and free speeches. There’s an argument in Japan started from the late 70’s among the conservative circle that GHQ had systematically censored any argument on political independence of Japan(read “having it’s own military”) for the sake of newly drafted constitution that does not allow Japan to arm itself which leads to total dependence on the good will of Washington.The far rightists are enlarging it to the level of claiming that MacArthur had castrated the reason of being of Japanese nationhood. 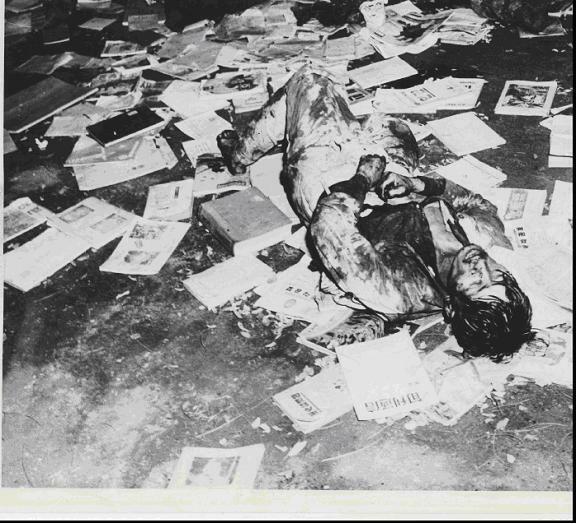 2)Looting of Antique books by the Japanese during the occupation of China were not intended for political censorship,but simple raid for war booty. 3)North Korean documents seized during Korean war by the US troops were combination of collateral damage and intelligence gathering. All three anectodal events you presented are different in the nature and the context and hardly “symmetrical”,just like MacArthur and Hitler comparison presented by SDHF,or at least so it seems to my eyes. You could simply write off SDHF argument as a Parthian shot desperately defending the system that imposed far more harsh censorship upon both Japanese and Asians than Douglas MacArthur could have ever imagined. But instead you start beating dead horse by putting solid works of Chinese academics on one hand and rants of Japanese revisionist on the other. OK,it’s your blog and the choice of what to write is entirely yours.The revisionists took the first shot and I,by no means to defend their aciton nor the cause in anyway. However,the issue at hand does influence the political lives of many living in the two nations,Japan and China,yet things get worsen by the year inspite of liberal version of history is dominating in Japanese academism and mainstream media,thanks to the third party focusing out of proportionate interests to man-bites-dog phenomenon in the field of Japanese historiography. At least Germans can count on Europeans to see an apple as an apple.But when the world sees Japan,it’s as if one rotten apple is enough to denounce the whole basket.Naturally,we are not amused and that is my source of discontent on this post. I also would like to inform you that I’ve been enjoying this blog for quite sometime.Keep up the good work. Aceface, I am sitting here in the sunbeam of a Japanese hotel in San Francisco, and have finally turned over the promised printout of this entry which I brought with me from Seattle so I could respond to your most recent comment. And now I get another six points or so (wreathed in a more manageable-looking three point frame work) to tangle with! So that’s my way of saying thanks, that I’ll try to digest these soon (while quickly agreeing that “symmetry” I mention among the documents and actions is anything but perfect or absolute), and maybe just produce a new post based on it in the next several days, since I’m running around this great city all morning. Thanks for your kind words about the blog; hope we can keep up the productive dialog.